Bernard Little, chair of Sheffield Green Party, at the rally against the cuts. Bernard said “These draconian cuts will affect nearly everyone in Sheffield. They will have a particular impact on people in much-needed public sector jobs. Plus those seeking work, women, young people, pensioners, people with chronic health problems and the 70% of people in this city who cannot afford even the cheapest mortgage. The unedited version of the speech follows. 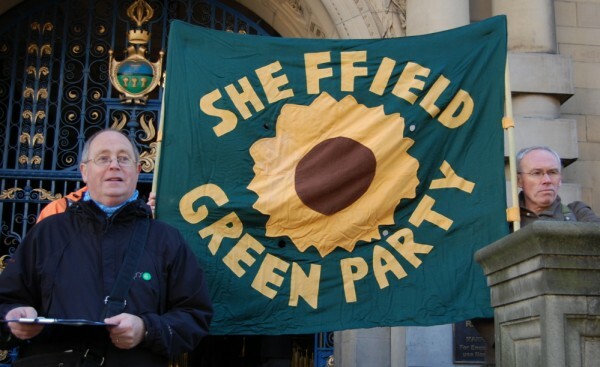 Speech by Sheffield Green Party Co-Chair 20th October 2010. “The public spending cuts, the biggest in 30 year, are a callous con-trick. Instead we should properly regulate the banks, tax the well off, properly fund public services and invest in the green economy. Such an alternative would reduce inequality and secure our future. thousands of people in public sector jobs,…….young people seeking work, ….the 70 percent of people in this city who cannot afford even the cheapest mortgage,…..people working in public transport and community based independent businesses……pensioners and people with chronic health problems. These are the people who were least responsible for creating the economic crisis we are in. We need public control of our money through properly regulating the banks. We need to remember that well funded public services and paying a living wage are the foundations of a fair society. We need to invest wisely in jobs and infrastructure that will create greater equality and ensure the health and welfare of future generations. So why are we in such a mess? The collapse of our economy has come about through the unwillingness of spineless politicians,….. like the last New Labour government and now the Coalition……., to properly regulate corporate interests and our financial system. Unregulated banks have….. in the interests of free market dogma… been given the go ahead to gamble with our money in the global casino economy and pursue reckless and irresponsible lending. . Yet economic growth remains the single most important policy goal of both government and official opposition. Absolutely nothing has been learned. The last time we were in such a dire straight was in the 1940′s. We were in far deeper debt…… yet the resolve of the post-war socialist government launched the National Health Service and nationalised many other vital services. 70 years later and we need a progressive government to pursue a new and resilient 21st century economy. Our youth, home care, housing, and public health and transport services need to be properly funded. Funding can come from increasing taxes for those earning over £100,000, cutting Trident, the road building programme and socially damaging export credit guarantee scams. The Campaign Against Climate Change Trade Union Group have shown how a low carbon economy would create one million new… fairly paid jobs within a year…. and spawn hundreds of thousands of other new jobs. That is jobs in insulation, renewable energy and public transport. We should not swallow the plans for an insecure…. globally mobile… knowledge economy. Instead we should switch to a low carbon economy through…jobs that last in local manufacturing and ecologically sound agriculture. The cuts are unnecessary. They are a callous con trick….. ‘foisted on us’ by the rich and powerful. The rich and powerful are using a crisis…a crisis that THEY were responsible for…. to privatise essential services and leave the most vulnerable in our society even more vulnerable. We must not be taken in by this callous con trick. A world where we co-operate rather than compete…. is possible.